Silat Walking, Shaking Hands & Running are aggressively moving attacks designed to overwhelm or trick an opponent while giving them no time to decide when or how to counter the coming attack. The less time the opponent has to analyze the attack the better. Part of the surprise of these methods is the sudden turning of the tables on the attacker. They were attacking and now with very little or no warning they are having to defend themselves. It is designed to take out the attacker before they can mount a decent defense of any kind. Running style is intended to overwhelm and run over the opponent in the same manner as walking style but much faster and with a greater ability to close in and change as needed. The real use of running style is to get all the way next to the opponent and pepper them with full body power open hand shots to the tune of 6 – 12 per second. We train 2 basic running style drills to help build the ability to do this properly while maintaining safety in the training. The first Running style drill is to have your partner hold their arms up in front of them in the hug the tree or hold the bowl posture then run up to them as fast as you can and pepper their arms with open hand strikes. Start in the front and run to the left or right as far as you can up your partners arm without hitting your partner on the shoulder(s). Then, continue back in the other direction back across the front of your partner and all the way back up the other arm. When you get close to the opposite shoulder then quit hitting them and run past them to simulate having gone through the opponent. The second Running style drill starts with your partner in a fist fighting position. 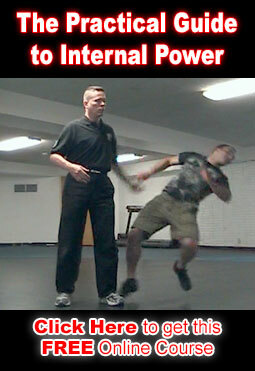 They swing on you in slow motion and try to maintain as much fighting integrity as they can while continually slow motion fighting and moving while you are performing the drill. The running style practitioner runs up to the fist fighting partner in slow motion and in slow motion open hand peppers whatever they can hit wherever they can hit it. Start with the arms and move into the face, head, shoulders and upper body. It should be obvious that in a real situation that the recipient would quickly and aggressively get the living daylights smacked out of them. This drill is intended to get you as close as possible to the reality of using the technique while maintaining safety for both people and particularly the recipient of the Running style. If the Running style is performed correctly then the recipient will feel completely overwhelmed and shut down by the running style practitioner.